Hair and Makeup Addiction is a UK-based company that specialise in creating the finest virgin hair extensions and high-quality vegan friendly makeup brushes. 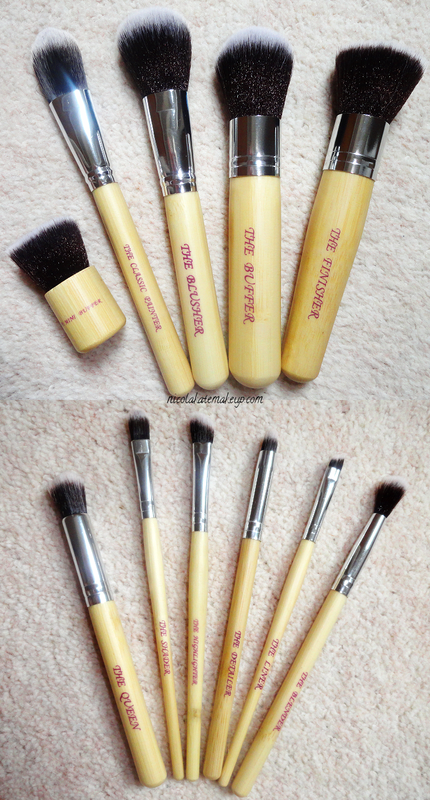 The company say their brushes are 100% vegan and have been sourced using eco friendly bamboo, which is a highly renewable source of material. I was lucky enough to receive Djimbi's face and eye brush sets, so I got to work with them right away! 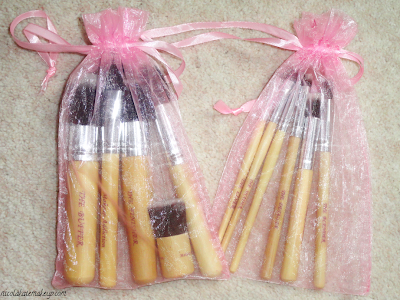 I'll start off by showing you the face brushes kit. What Hair and Makeup Addiction say about this set: "The Essential face kit contains five face brushes that allow you to complete your face from the beginning to the end. They are designed with synthetic taklon bristles, which are not only extra soft, but they apply powder as well as liquid products without absorption into the bristles. They are also vegan friendly so not a single hair on an animal was touched nor harmed in the production of these brushes. These brushes are perfect to use for everyone, from those makeup beginners to professional makeup artists." 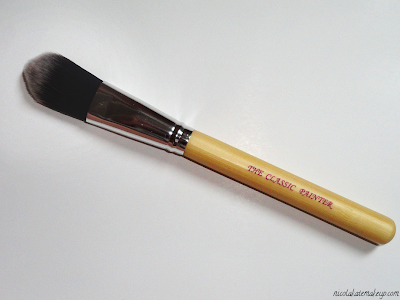 'The Classic Painter' is the perfect brush to use if you prefer the traditional method of applying your foundation. 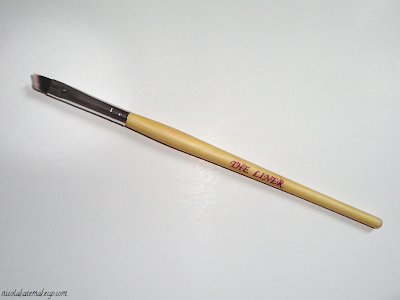 What I really like about this brush is that it's not so small that it takes you forever and a lifetime to complete your application, nor is it too big that it doesn't fit into the smaller areas of your face such as around the eye area and around the nostrils. 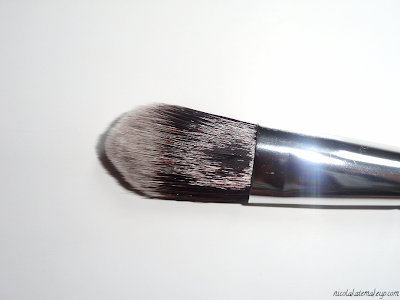 It's quite dense for a foundation brush, too, and I noticed that when I used this brush with my liquid foundation, the product didn't completely 'flatten' all of the bristles together which usually ends up resulting in a streaky finish. 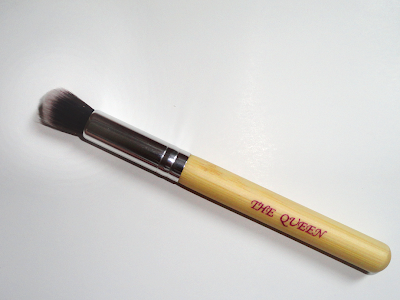 Hair and Makeup Addiction say this brush is also ideal for applying face primers, highlighting underneath the eye area, and contouring the nose. I can imagine that it would be a great brush to contour the sides of the nose with as the bristles are quite tapered. 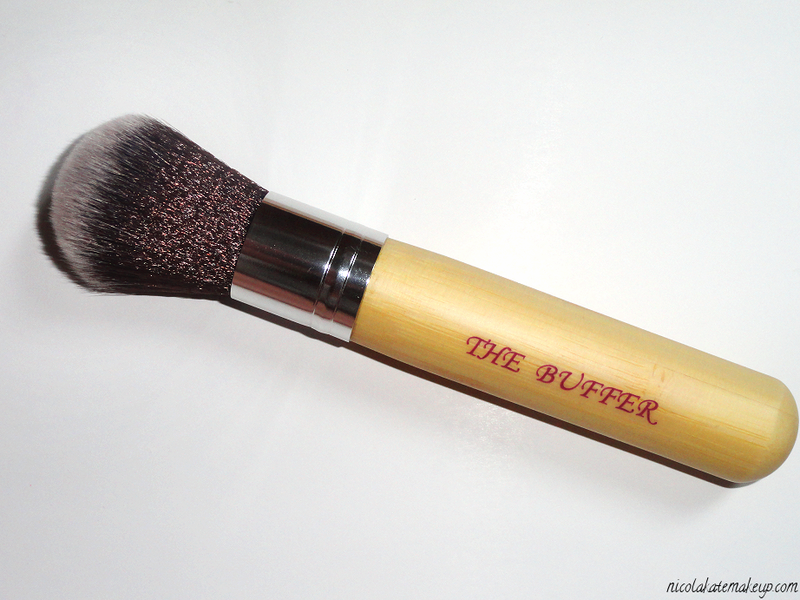 'The Buffer' brush is your typical powder brush that is ideal for setting your entire face once you have finished your foundation application. 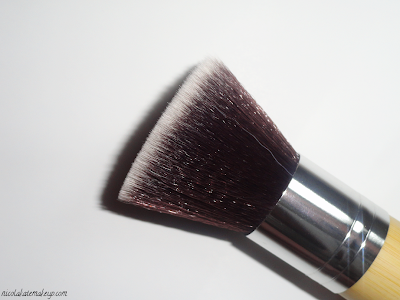 It's definitely quite a dense brush, and I noticed that this helped massively in providing more control over my product placement in comparison to my other powder brushes, which have longer and more 'floppy' bristles compared to 'The Buffer', so I'm greatly fond of this brush for that reason. I also noticed that a denser brush is capable of providing much more coverage where it's needed, and this brush does just that. 'The Blusher' brush is deal for applying cream and powder blushes to the apples of the cheeks. Once again, it's quite a large brush that is also slightly tapered, offering more control over product placement. The brush applies both cream and powder blushes with ease and blends product out beautifully. It's also a great little brush for applying a soft contour the hollows of the cheeks. I also love to use use this brush to apply a quick dusting of my highlighting powder across my cupid's bow, and also to the tops of my cheek bones. 'The Mini Buffer' brush is a multi-purpose miniture version of the 'The Finisher' brush. 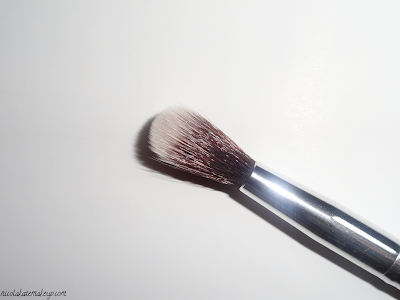 This small flat-top kabuki brush is ideal for slipping into your handbag for quick foundation or powder touch-ups or generally applying your makeup whilst you're on-the-go. It's also a great little tool for applying highligher and blush - and you can also achieve a pretty neat contour with it, too. Overall, a really handy little brush to have on you at all times. What Hair and Makeup Addiction say about this set: "The Special Eyes Kit is designed with synthetic taklon bristles, which are very soft and also vegan friendly. Not a single hair on an animal was touched nor harmed in the making of these brushes so you can rest assured. 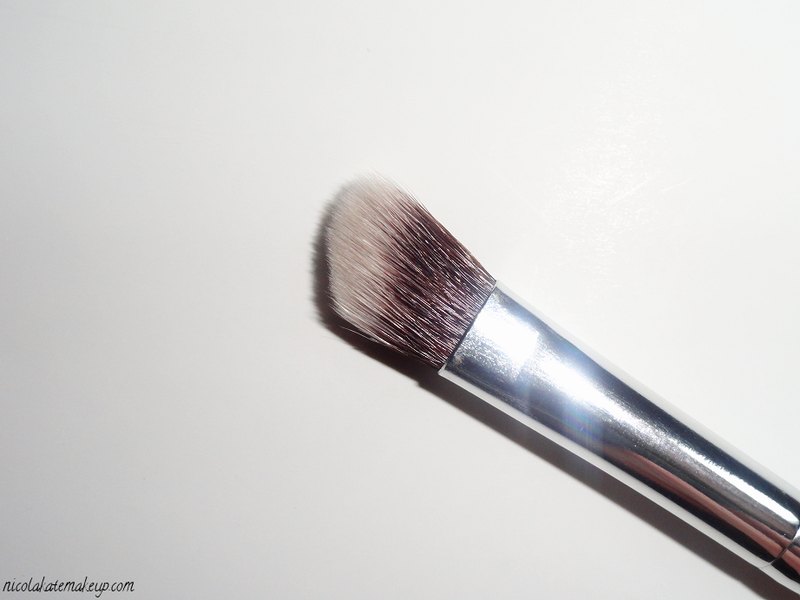 These brushes are perfect to use for everyone from makeup beginners to professional makeup artists." 'The Shader' is a flat brush that you would typically use to pack on an all-over lid colour to my eyes. 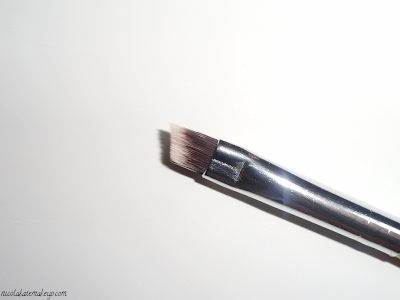 What I really like about this brush is the fact that it's not too stiff, which means I'm also able to slightly blend my lid colour out with it which makes it a little easier for me when I go in with my blending brush. 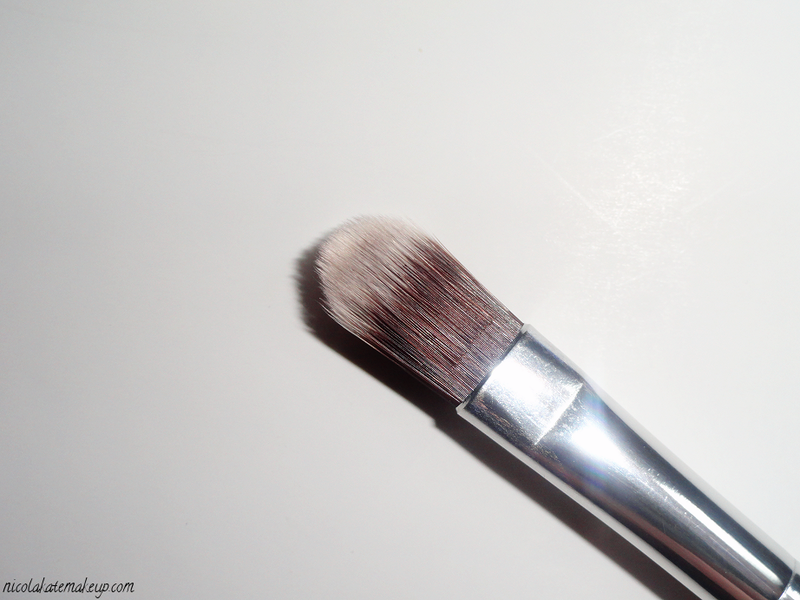 This brush is also fantastic for concealing any blemishes or skin-imperfections, and also works great when using concealer to hide any dark under-eye circles as it fits perfectly underneath the eye. Hair and Makeup Addiction also say that this brush is ideal for 'carving out' and defining your eyebrows, but I personally feel that the bristles aren't stiff enough and are a little too long for that. But having said that, I like how this brush isn't so stiff as I already have a tonne of stiffer shader brushes, so it's nice to have this one as part of my collection. 'The Blender' brush is such a lovely little brush! It's super ideal to apply colour to the crease as it fits perfectly into that area of the eye, and it also blends out shadows like a dream. 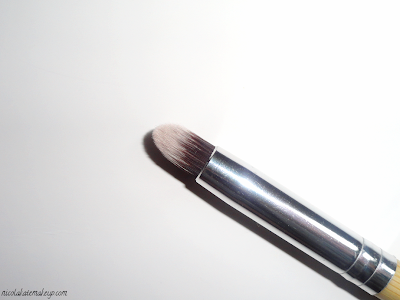 It's not a huge blending brush so you can still maintain control over how far you're blending out. It actually reminds me a lot of the Urban Decay Naked 2 crease brush (not the smaller Good Karma crease brush!) in the way it performs. 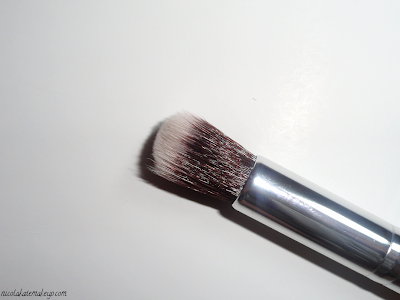 This brush is also a nice little brush to apply under-eye concealer with, too. Probably one of my favourite brushes out of the collection. 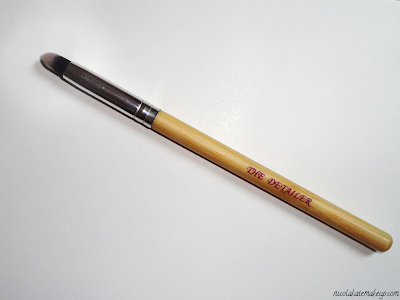 'The Detailer' brush is a super dense pencil brush that works magic when it comes to applying and blending out shadows to the lower lash line. 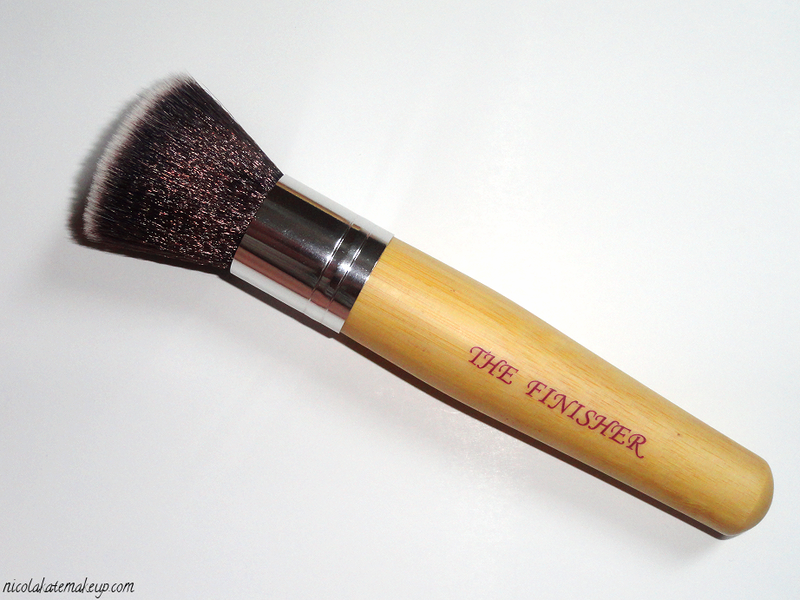 This brush is also AMAZING and extremely precise when it comes to applying an inner-corner highlight around the tear duct area. 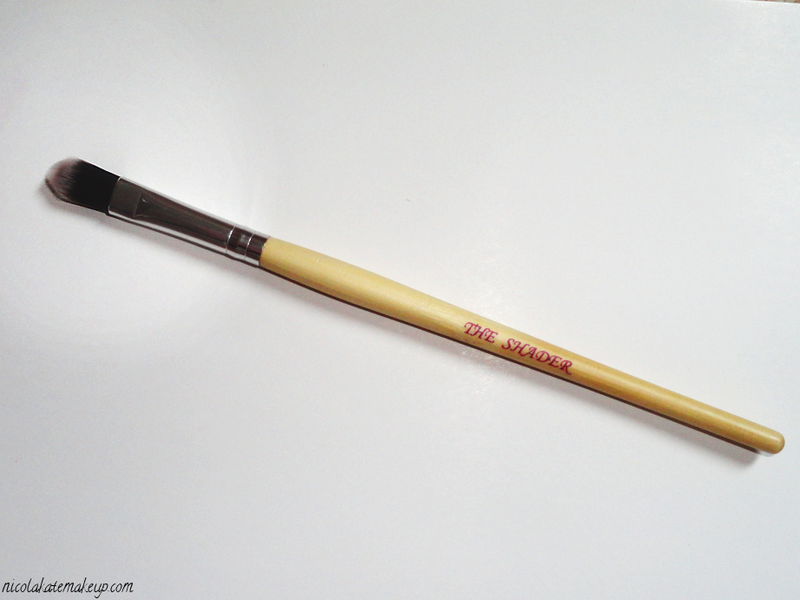 I've recently been using this brush to apply shadows to the outer corner of the eye and to shade in the outer 'V' and have been very impressed with it so far! 'The Detailer' is awesome when it's used to create a sharp crease, too. Without a doubt, another one of my favourites out of this whole brush set. This brush is actually stiffer than what it appears to be in the photographs, and I've never actually owned a brush quite like this before. Sure, I've own angled eyeshadow brushes in the past, but I've never owned one that fits perfectly to the contour of the brow bone like this does. 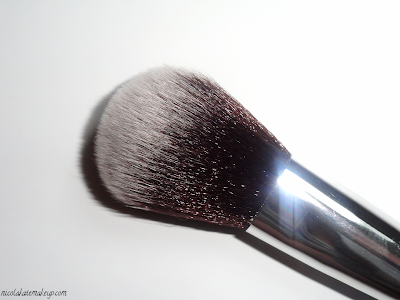 'The Highlighter' blends out your crease colours and highlights at the same time. It's stiff enough to be able to really pack on your highlight shade for those more dramatic looks, but not so stiff that it doesn't blend everything out. 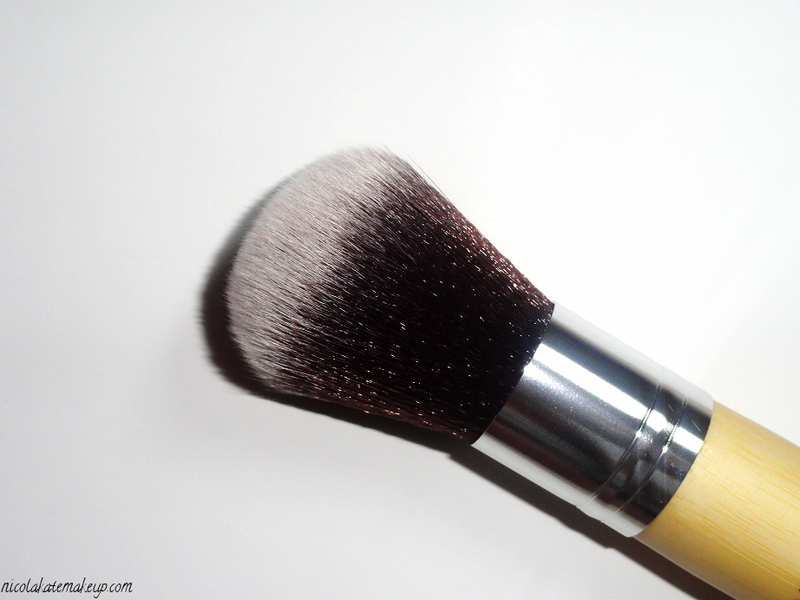 I also love using this brush to pack on an inner-corner highlight, as the angle that this brush has allows it to fit perfectly into the inner-corner of the eye. 'The Liner' brush is a small, angled brush that you would typically use for applying gel or liquid liners and filling in brows. This brush has noticeably longer bristles than most small angled brushes that I'm used to using, so I did find it a little challenging to get super neat eyeliner right off the bat as I felt like I didn't have as much control compared to the brushes I'm usually used to using.. With a little work, I was able to get great results with this brush - but I'm much more used to using angled brushes with shorter, stiffer brushes and I feel like this brush will take a little getting used too. However, one thing I really did like about this brush is that I found that I could achieve a really natural, soft looking brow with it. I usually use my MAC 208 brush to create well defined brows, but I think I'll sway to this brush on my more natural 'no makeup' makeup days. I'm not going to lie, at first I was a little confused as to what this brush was actually for. Is it an eye brush? 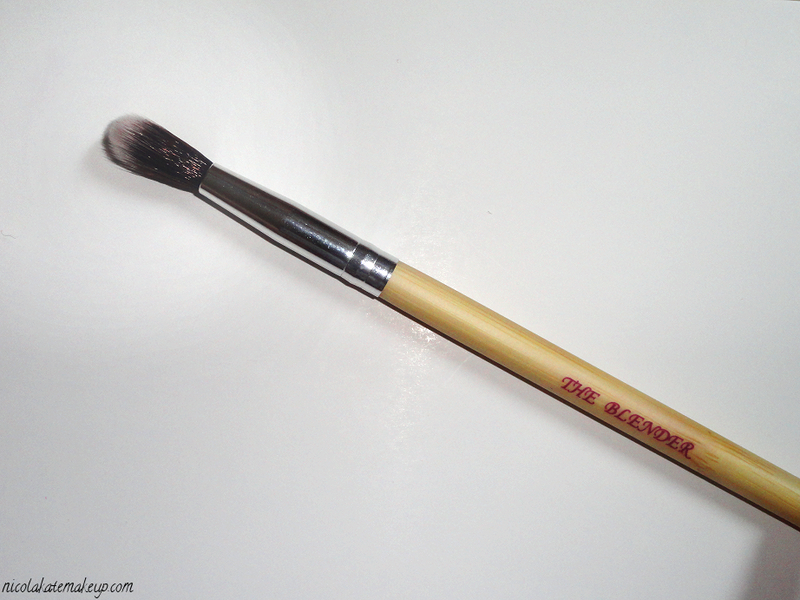 Is it a concealer brush, or a face brush? At first it looks too large to be an eye brush, but after a little playing around with it, I discovered a tonne of things that this brush is fantastic for! 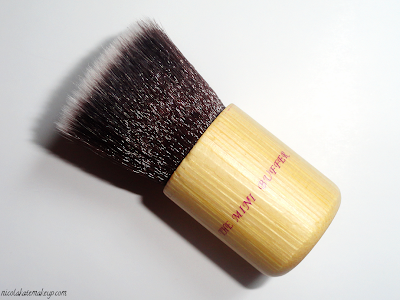 This really is a great little multi-purpose brush. One of my favourite ways to use it is for applying a wash of colour all of the lid whilst simultaneously blending out any harsh edges for an ultra diffused appearance. It's also great for blending out any crease colours or adding a highlight shade in one quick swoop and This is also ideal for creating a very strong contour to the cheekbones. 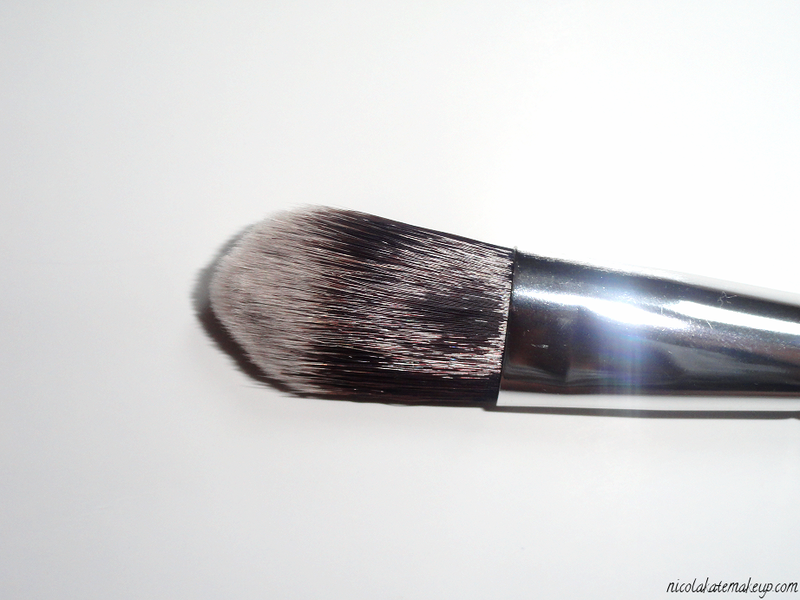 This brush can also be used to apply concealer to the under-eyes or to cover up any blemishes or skin imperfections. Hair and Makeup Addiction say that you can also apply bases and eye primers with this, too - making it the ultimate multi-purpose brush! Overall, I am thrilled with these sets and have barely touched any of my other brushes since receiving them in the post last week. They are, without a doubt, some of the softest brushes I've ever had the privilege of using - and they actually remind me a lot of EcoTools, but I'm tempted to say that these are even softer! 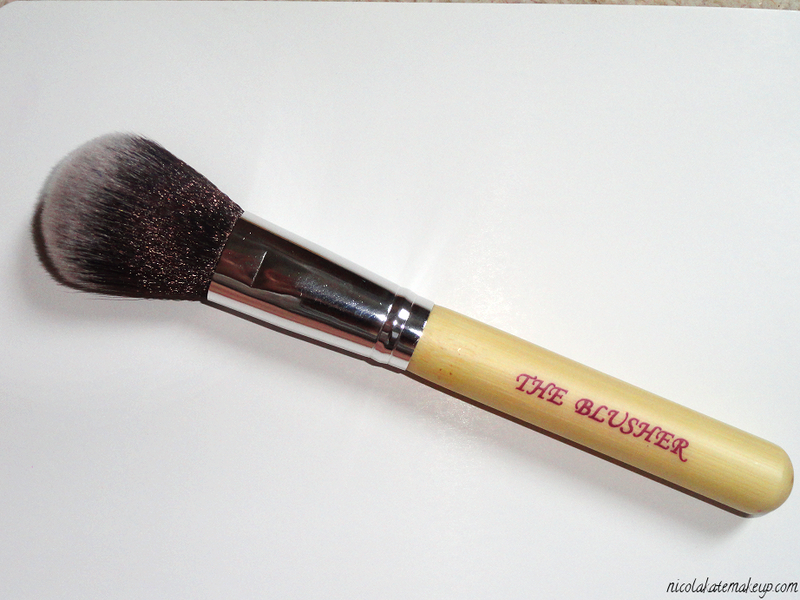 I love the fact that they are totally eco and vegan-friendly, and the brushes themselves feel very high quality. It's obvious that a lot of love and thought went into creating each and every brush that Makeup and Hair Addiction have to offer. Hair and Makeup Addiction also offer the complete set at a discounted price of £60 - which is an absolute bargain for 11 outstanding makeup brushes, so head on over to the website and check them out! Wow, these brushes look great! I really like the Blusher and Shader. They look so soft omfg I'd probably spent all my time rubbing them all over my face (clean, of course!). I must admit I have spent a good amount of time just feeling them because they are SO soft! Definitely great value for money! Did you have a problem with shedding?